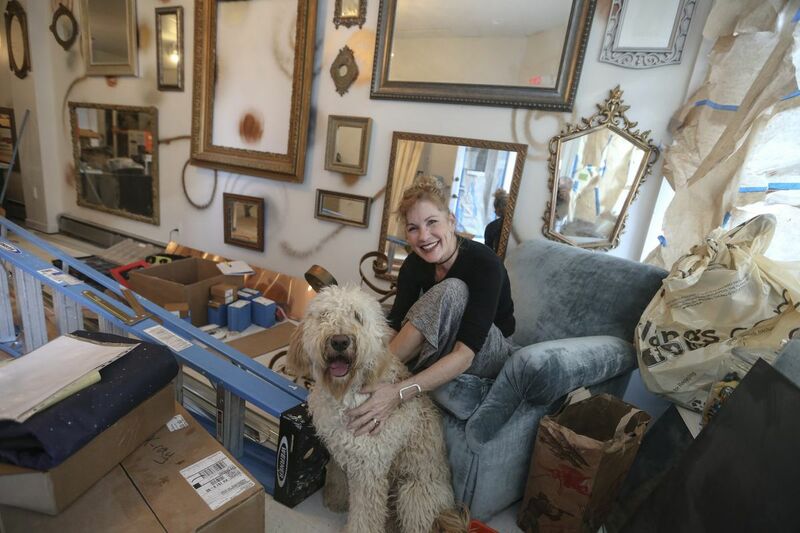 Singer-songwriter Laura Mann, disappointed with the lack of rock spaces in the city for small acts and women, decided to open her own space — the Living Room in Ardmore. Mann and her dog, Casey, in the final stages getting ready for the opening. Many of the venues where Philadelphia rocker, singer, and songwriter Laura Mann got her start — smaller rooms like J.C. Dobbs, Tin Angel, and the stage at the Khyber Pass — have closed as of late. But instead of hanging it up, Mann did something else: She started her own venue. So, instead of hanging out with husband, Carl, and seven-month-old goldendoodle, Casey, Mann finds herself resting up from her day job as massage therapist by readying an intimate, live BYOB music and performing arts venue. The Living Room @ 35 East, opening Saturday, is located a few doors down from the relatively new Ardmore Music Hall – originally called 23 East, the legendary stomping grounds of the Hooters. "There are no more hotdogs to be found," she says, laughing, when we bring up the wieners once sold in front of 23 East after concerts. Instead — as part of Ardmore's main drag — there are new spots such as Pala's Latin American and Iron Hill Brewery to go with Mann's own Living Room. "Ardmore is creating its own vibe with great new restaurants and live entertainment throughout the week. It's nice to see." Mann is adding to both the area's newfound cool and a Philadelphia music scene where midsize venues like the Fillmore and Union Transfer have thrived, but lacking in the smaller rooms she had available to her when she began playing out in the 1980s. Mann is sad those sonic landmarks she once frequented have closed. "But the Living Room is a project for me to showcase some of the amazing talent that is out there now, and, which includes my many talented friends that I have come to meet and get to know over the years," she says. The early part of the Living Room's schedule reflects this camaraderie; she's booked old pals such as Greg Davis and Wally Smith (3/3), Minas (3/9), Christine Havrilla (3/29) and John Torres (3/31). Mann started her career playing alongside South Street musicians such as the aforementioned Davis, Smith and the late Robert Hazard. She even formed her first ensemble long before he came to write hits such as "Girls Just Wanna Have Fun." A mutual friend — Philly guitarist Mike Vesper — saw her singing at an outside concert in Medford. "Mike said that he and Robert were forming a rock band and would I be interest in joining. At that time, Laura and the Lifeboys came about. But when the band broke up, I picked up my acoustic guitar and began playing solo," Mann says. "From there, I shared the stage with some greats such as Warren Zevon, Al Stewart, Dave Mason, and Bobby Caldwell at places such as the Chestnut Cabaret, and even the 23 East Cabaret down the street." Mann released several dreamy pop, poignantly lyrical albums since then, such as Bow Tie and Rose Tattoo and Like a Lamb Among the Lions. She is even currently working on an EP with Tears for Fears producer-guitarist Charlton Pettus, featuring her own songs alongside covers by Depeche Mode and Chaka Khan. In 2002, however, Mann stepped away from music full time to become a certified and licensed therapeutic and corrective massage therapist, creating her own practice in 2005. "I'm fortunate to have wonderful clients and the opportunity to assist in healing others," she says. "I even like to listen to the Spa Channel on Pandora." That doesn't mean she gave up thinking about music. Sure, she'll play her own intimate room – a cozy venue, at only 800 square feet – on occasion, but she did not build the Living Room to suit her vanity or artistic whim. "It's not about me at all," she says. "I didn't open the Living Room because I needed a place to play. The Living Room is an opportunity for talent to be showcased and have fun." When it comes to curating the Living Room, the job is all hers, from Feb. 24's opening night Americana-focused headliner Scott McClatchy to a show featuring her writing partner Dan Navarro, who penned Pat Benatar's "We Belong" and performs voice-overs for animated series such as Family Guy (April 6). She is also screening films (Jay Schwartz's long-running Secret Cinema series will be there May 26) and hosting comedy nights, poetry readings, and small theater events. During the day, the BYOB Living Room will be a café with all its sipping and noshing accoutrements and offer a schedule of music lessons. Mann is working with her husband — a partner in the 35 East construction project — and is loving the casual decor and full interior design aspects of the gig. "I'm always renovating something. I drive my husband nuts really. When it comes to the big labor I am more of a great pointer," she says. "But then again I've been involved with this project from tearing down the ceiling, painting, lugging around lumber … I'm a regular at Lowe's and Home Depot now — at least as much as I used to go to clubs when I started."